Naples, with its reputation as the dirty, crime ridden, nationalistic centre of the Italian south, wards away less open minded travellers. There may be some small truths in its reputation, but sometimes taking risks comes with great rewards. 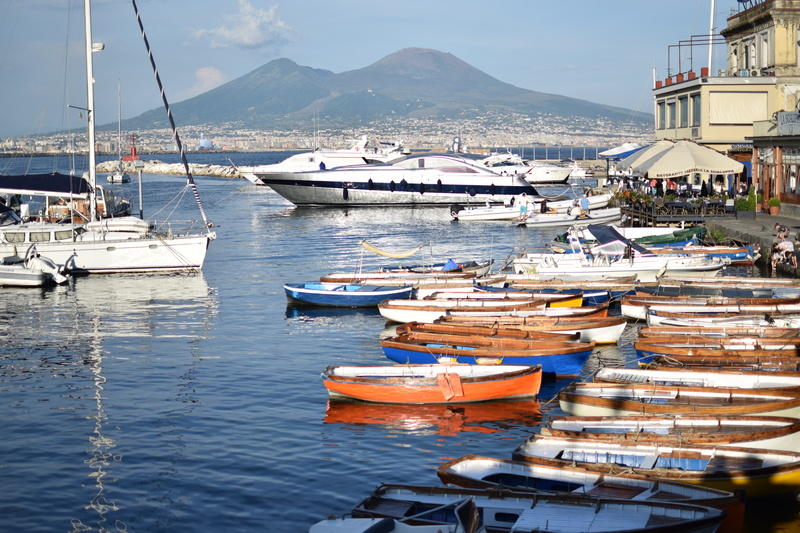 Naples in a more positive contrast is a historic city, filled with grand ruins, culture and passion. 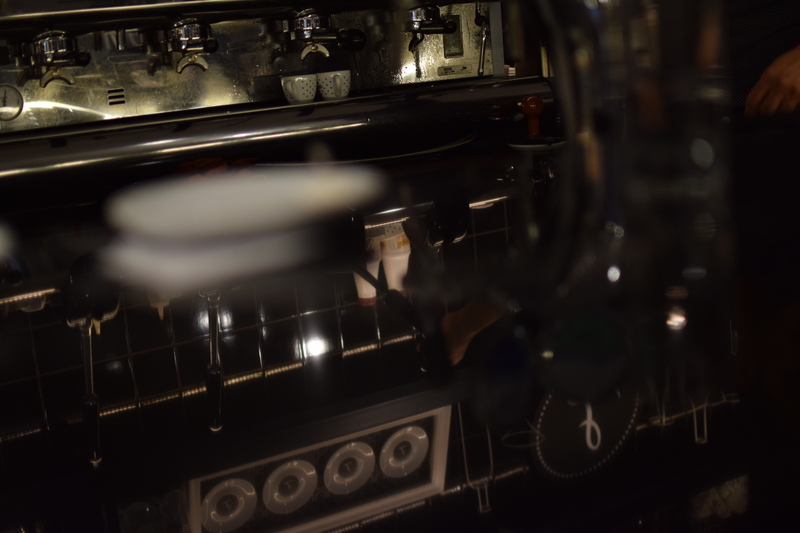 A passion that extends through its pizzas, its pasta, its gelato, its sfogliatelle and in this particular case its caffe, or as you or I would call it, its espresso. 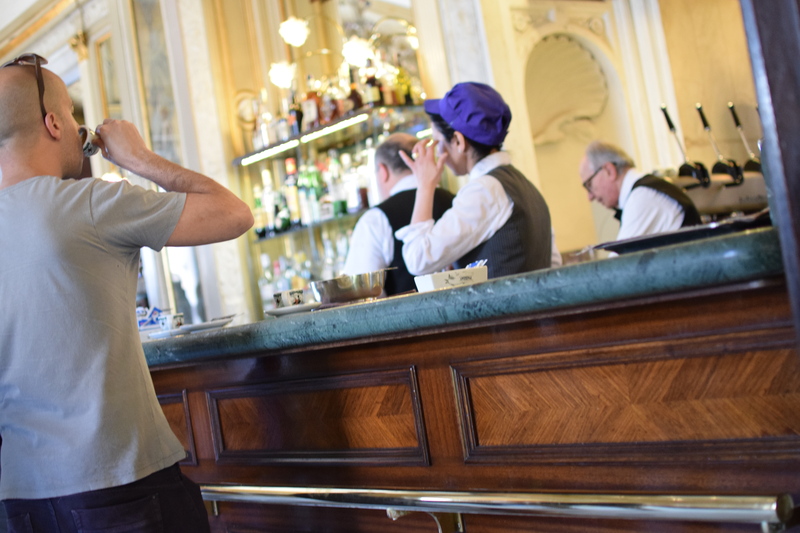 There is no better place to start an espresso tour of Naples than at the Gran Caffe Gambrinus, arguably the centre of the Neapolitan love of caffe. 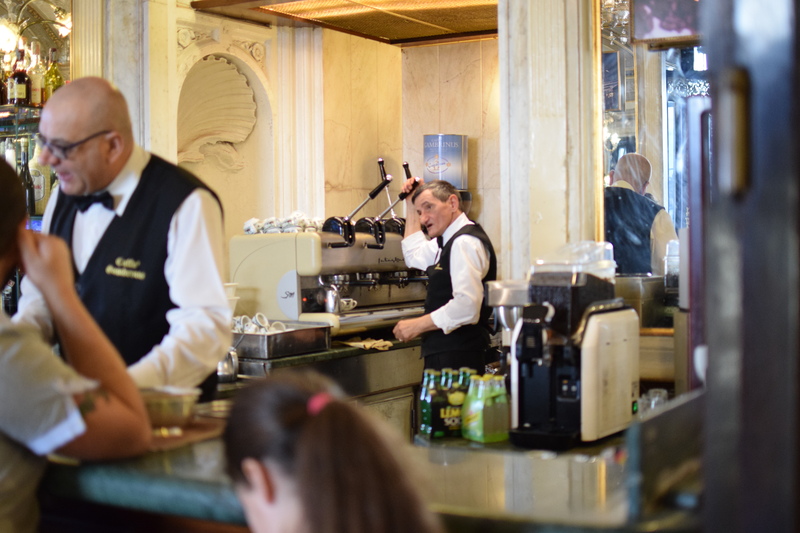 Gambrinus sells chocolates, gelato, pasticceria, beer among other things, but right at the centre of its operation is a long Italian style standing espresso bar. 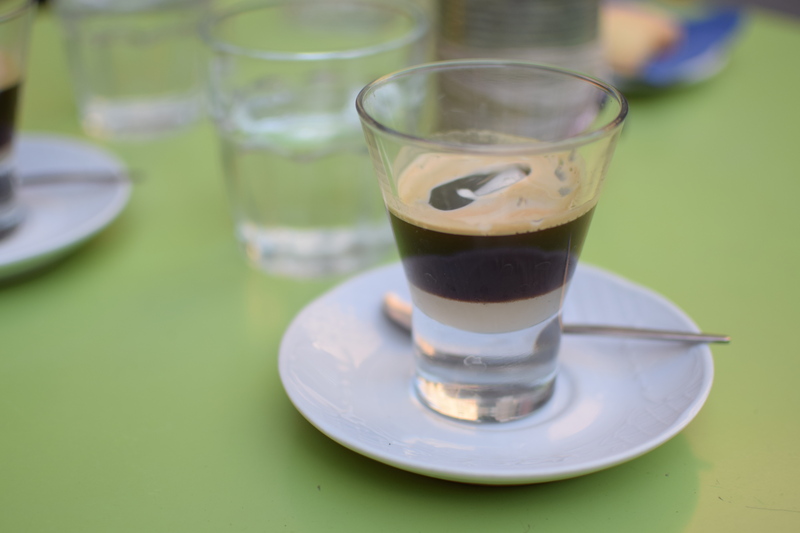 As with all neapolitan cafes the list of coffee based drinks is rather large, there’s a lot of signature style coffee drinks here in Naples, but wanting to get at the heart of neapolitan espresso I ordered ‘due espressi’, that’s two espressos. Paying at the till counter, I took my receipt over to the hustle and bustle of the standing bar, where you can rub shoulders with the locals for a spot at the bar to place your receipt. The barista tearing your receipt, stamps down two glasses of water hard onto the marble bar top as you wait for your espresso to be pulled. The barista pulling shots in the back corner, you begin to realise is a machine, in the time we waited for our two espressos he must of pulled off no less than 20 shots on his four group head San Marco lever machine. 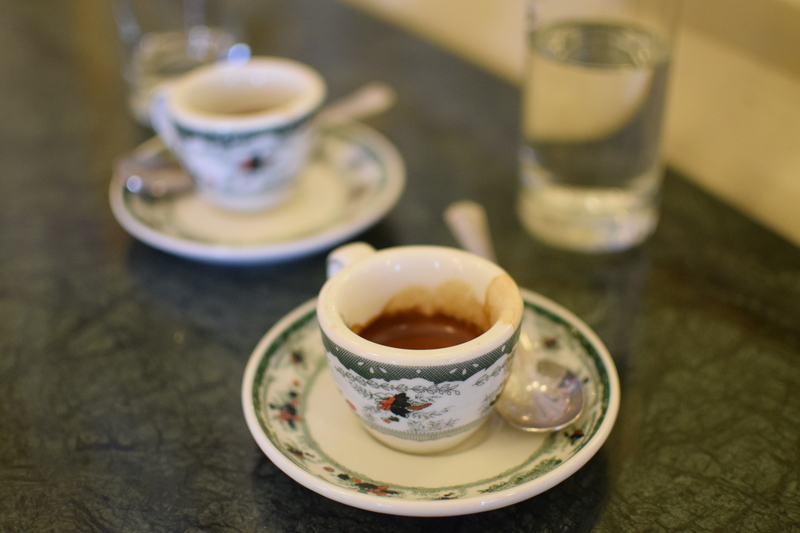 The espresso arrived as a shortish shot in one of Gambrinus’s beautifully designed Richard Ginori cups with the aromas of toasted nuts and icing sugar. With a medium thickness of crema the shot starts bittersweet like sugared almonds and burnt caramel opening up into a sort of lemongrass like acidity with some distant background watermelon, all buried in a syrupy molasses mouthfeel. 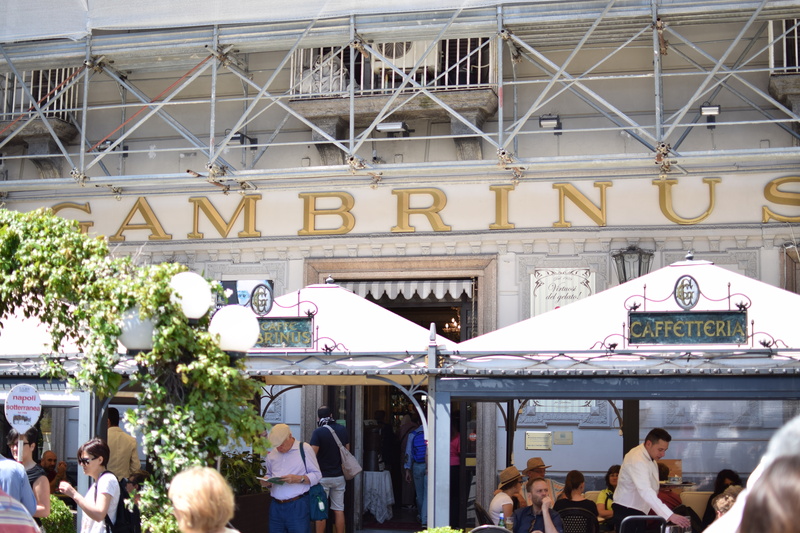 The Gran Caffe Gambrinus was such a pleasurable affair, we went back again the following day for more espresso and cake. 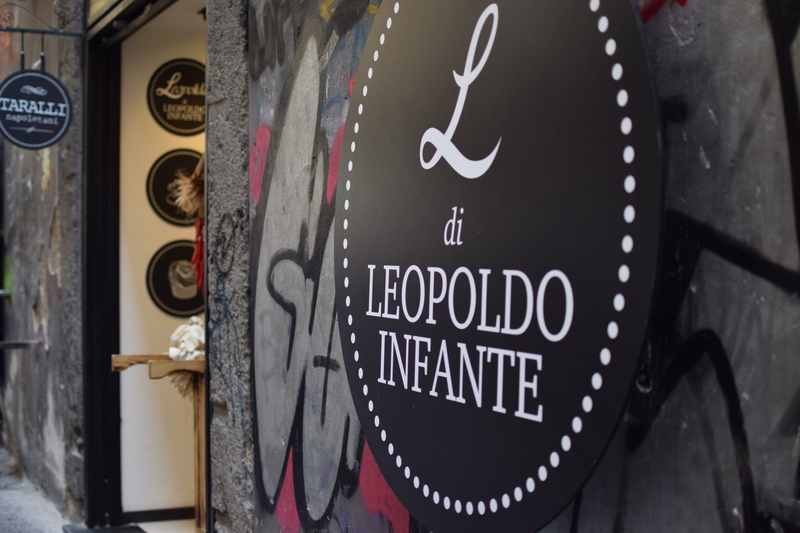 One of the more modern cafe groups in Naples, Leopoldo Infante’s black and white polka dot interiors immediately stand out against the tradional styling of Naple’s streets. 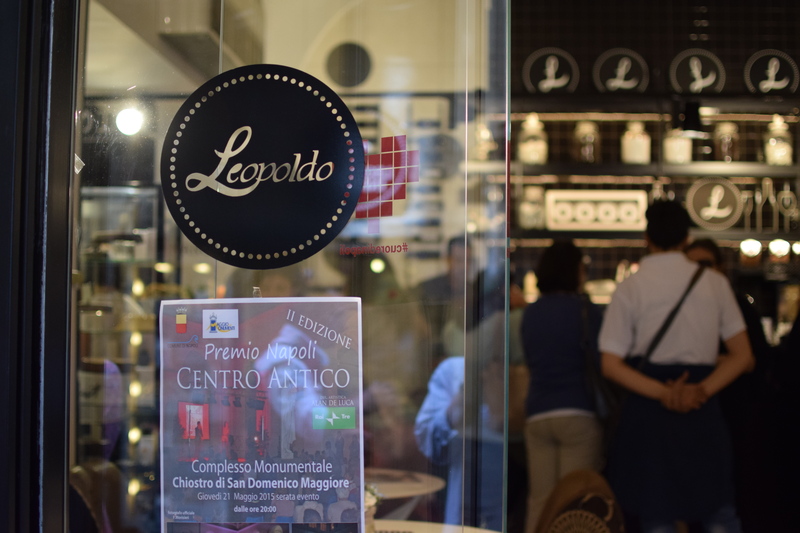 Looking clean and sleek, Leopoldo’s branding pulls you in off the street to find that they are no less passionate about coffee and pasticceria than anyone else. 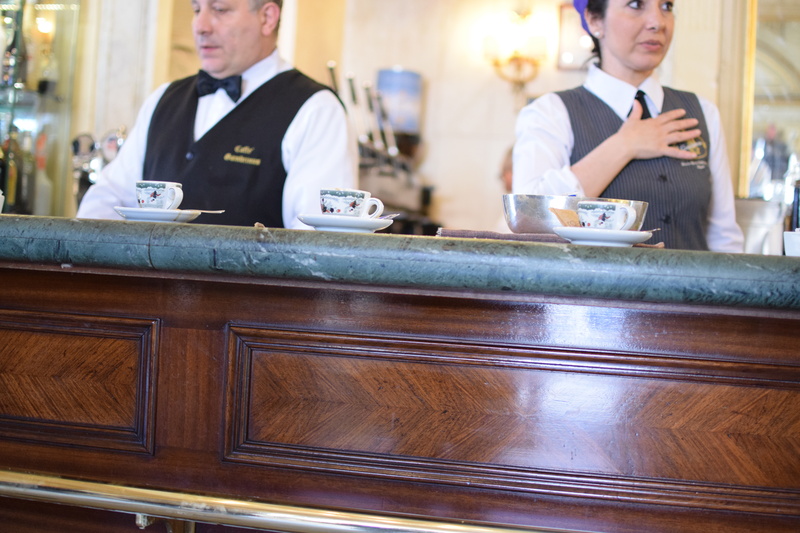 The espresso here is the same as before, pulled from a lever machine, served at a standing bar with a glass of water, whether it’s new or old it doesn’t matter, that’s just the way coffee is served here. The only difference here is that your espresso is served with this mini little meringue nests to use as sugar should you require some. The shot arrived shortish like last time, but with a slightly thicker crema and sour lime florals on the nose. To taste it began as bitter caramels before opening up into a light sourness of limes followed by some sweet cherry, it was syrupy in the mouthfeel, which was to be expected but also had a light juciness to it. 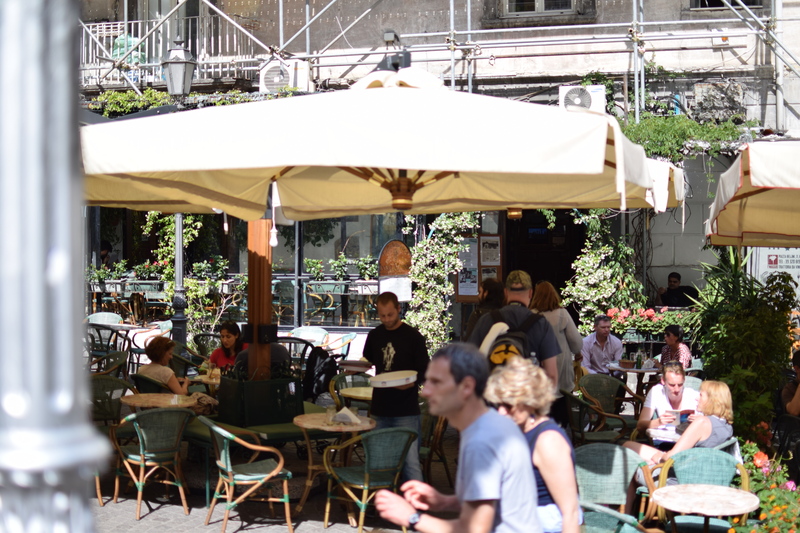 Intra Moenia set in the beautiful surroundings of piazza Bellini is probably more famous for its atmosphere than its coffee. The building is covered in greenery, with leaves adorning all the doorways and window frames, a small garden oasis in the heart of the city. That’s not to say that the coffee isn’t good here it’s just that you might want to stay here longer than it takes to drink an espresso. Here you’re encouraged to sit outside in the garden rather than stand at a bar, so we took our seats in the relaxing shade. 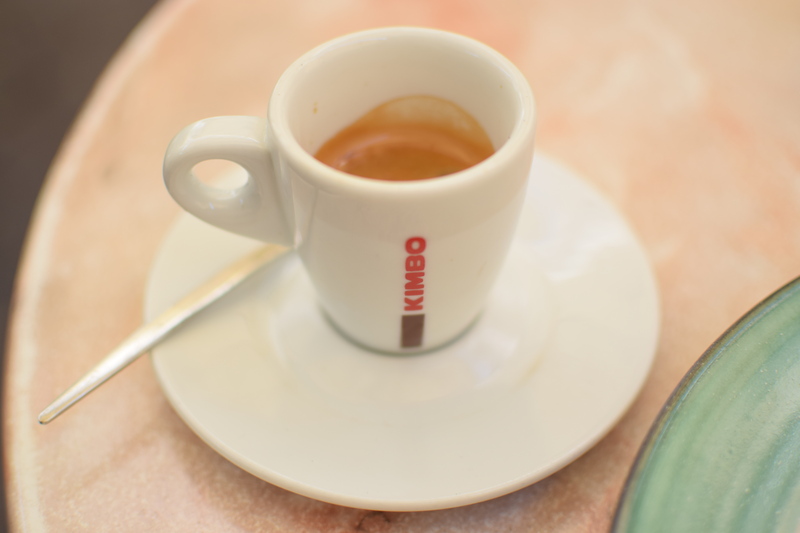 Here they serve Kimbo espresso, which to them, is their local roaster, with Kimbo originating from Naples. Again arriving as a shortish shot of a lighter colour, this time with a medium size crema and notes of caramel and burnt grapefruit on the nose. To taste it begins bitter like burnt brown sugar before opening up into slow building grapefruit acidity and a sweet almond biscuit in the finish. A slightly mellower espresso its slippery syrup like mouthfeel is lighter and more refreshing. 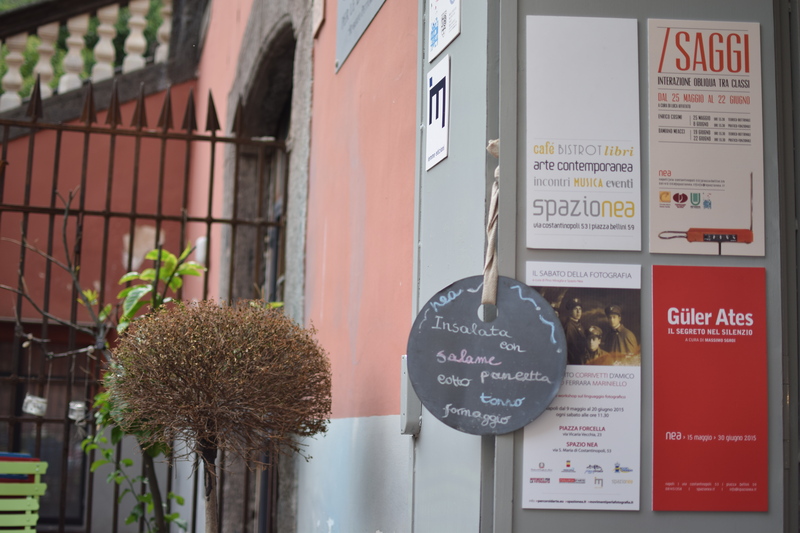 A short walk from Intra Moenia, SpazioNea is a modern cafe that also doubles up as a contemporary gallery space for art exhibitions. 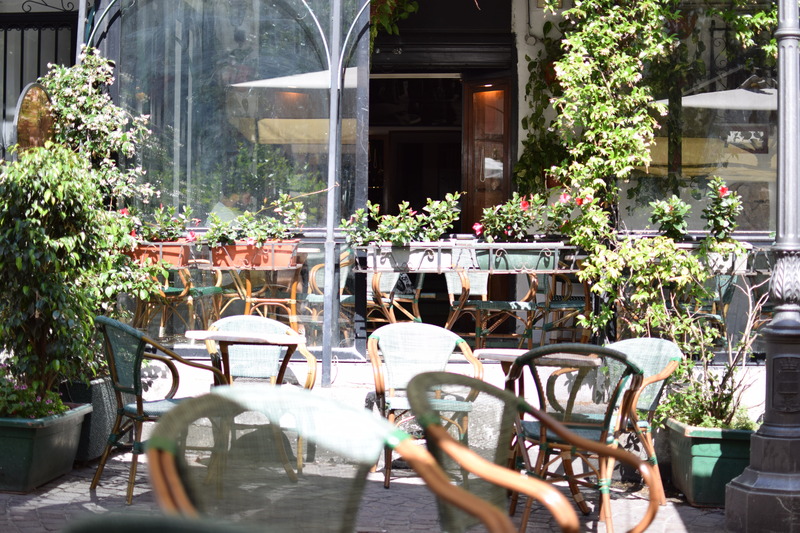 With a somewhat quaint interior perfect for working in, the cafe opens out into an open courtyard filled with a rainbows selection of chairs and tables. 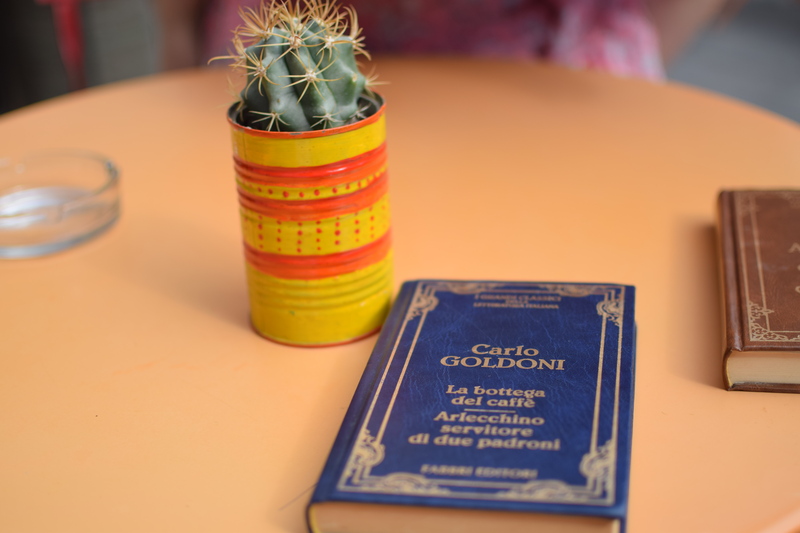 The menus come in the form of short novels, where the first few pages list off the menu items before introducing you to the story on the front cover. 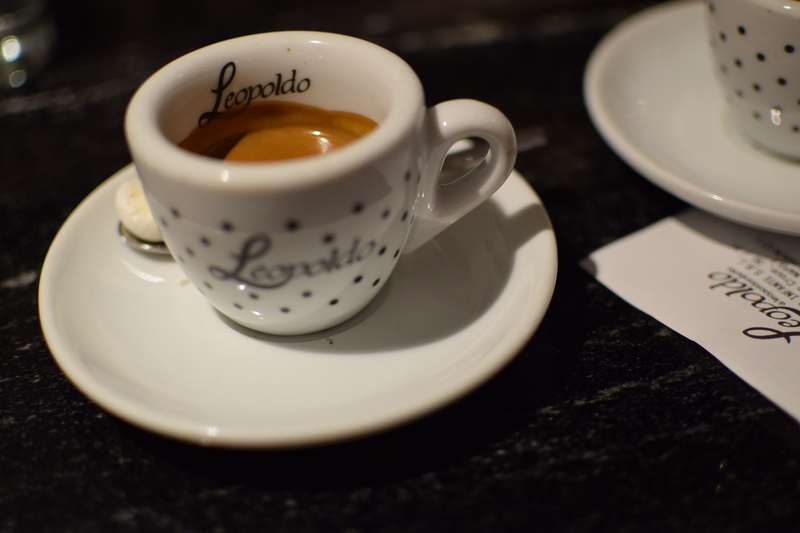 Had my Italian been up to scratch I would have continued on, instead I ordered an espresso. 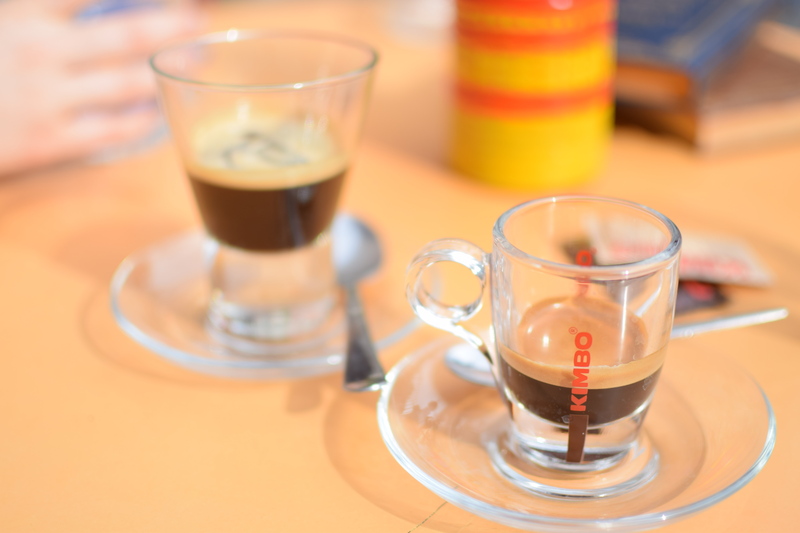 Here again they serve Kimbo espresso, which arrived this time in glass. Shortish in length the crema was medium sized and came with sugared almond aromas with some florals. To taste it began as bitter grapefruit before opening up into a fairly punchy middle and sharp finish with a flavour akin to toasted bread with honey. The mouthfeel was reminiscent of canned fruit syrup with extra body. Alongside the espresso I ordered, my girlfriend opted for the Caffe Salerno, having wanted something colder. Their signature drink was a shot of espresso over almond syrup with ice, to taste it was a battenberg cake, unmistakeably. It was that good, we came back the next day for another. 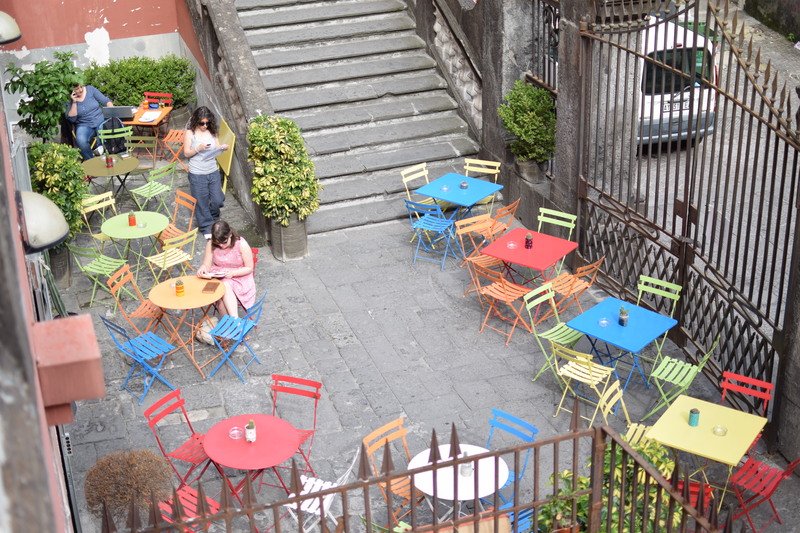 SpazioNea was a lucky find, drawn in off the street to see their art, we found their cafe at the back by accident. Offering a great balance between art, design and espresso with great surroundings and a fantastic outside space, its a great place to while away an afternoon. 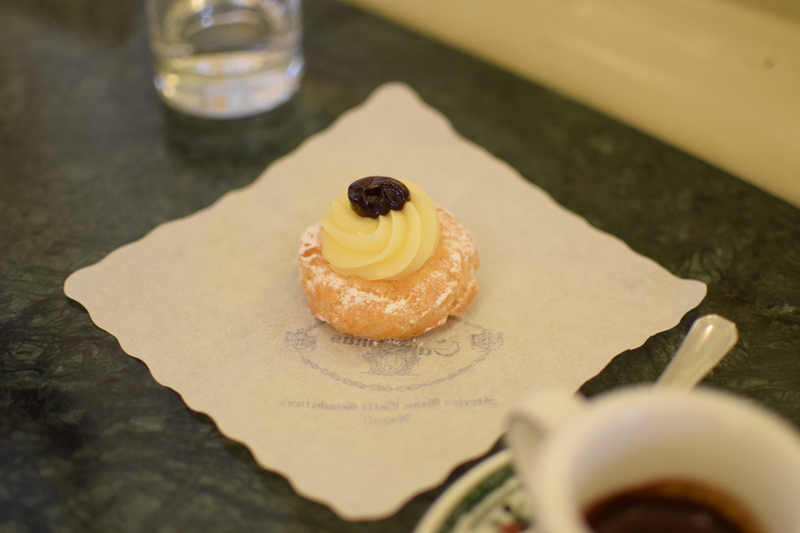 This entry was posted in coffee, Espresso, Naples, Uncategorized and tagged Coffee, Espresso, Gambrinus, intra moenia, Leopoldo Infante, Naples, Spazio NEA by commoditiesconnoisseur. Bookmark the permalink. Thanks mate. In Naples now. Solid post. A couple of people said Bar Mexico has the best. Gonna check it out.